Exciting conversations are budding on Youth Voices and on Voices on the Gulf. Martha, a senior at the East-West School of International Studies in Queens (Paul Allison's school) begins this episode of Teachers Teaching Teachers by putting out a call for other students to join us on TTT. She wants to talk about how students express themselves creatively outside of school. We hope more students will be able to join us on the next TTT, Wednesday, October 13, 9:00 pm Eastern / 6:00 Pacific. Margaret Simon, whose elementary school students have been shining on Voices on the Gulf joins us on this podcast as well. Margaret has invited a few of her students to join us on TTT this coming Wednesday as well. Gail Desler, Chris Sloan, David Pulling have updates to share with us as well. We talk about research, I-Search and more! Enjoy this podcast. Join us on Wednesday, and invite a student to join us as well. More about Scratch! More about gaming. More about social networking. Youth Voices. Voices on the Gulf. And we invited a couple of students too! This was our fall semester kick off. Kylie Peppler, an Assistant Professor in the Learning Sciences Program at Indiana University, Bloomington. Kylie Peppler is an Assistant Professor in the Learning Sciences Program at Indiana University, Bloomington. As an artist by training, Peppler engages in research that focuses on the intersection of the the arts, media, and new technologies. A Dissertation-Year Fellowship from the Spencer Foundation as well as a UC Presidential Postdoctoral Fellowship supported her early work in these areas. Peppler has published numerous journal articles that will or have appeared in E-Learning, Learning, Media and Technology, Teachers College Record, and The Cambridge Journal of Education on the arts, new media, and learning. She also has a recent book titled, The Computer Clubhouse: Constructionism and Creativity in Youth Communities (Teachers College Press, 2009). Peppler is currently a co-PI on two National Science Foundation funded studies on creativity in youth communities as well as a PI on a grant to study the development of systems thinking dispositions through the design of digital arts projects funded by the John D. and Catherine T. MacArthur Foundation. 66:31 minutes (15.22 MB) The conversations around Voices on the Gulf continue on this epis ode of Teachers Teaching Teachers. Joining on this show with Gail Desler, who works with teachers in the Sacramento flyway in California, and three guests from Louisiana: Margaret Simon, David Pulling and one of his students at Louisiana State University at Eunice, Erin Jackson. Learn more about teaching and learning about the environment, including references to bird artists John Muir Laws and Olivia Bouler. Laura Fay is an 8th grade reading teacher at Fisher Middle School in Ewing, New Jersey; her students use Scratch to compose multimedia as part of her journalism curriculum. 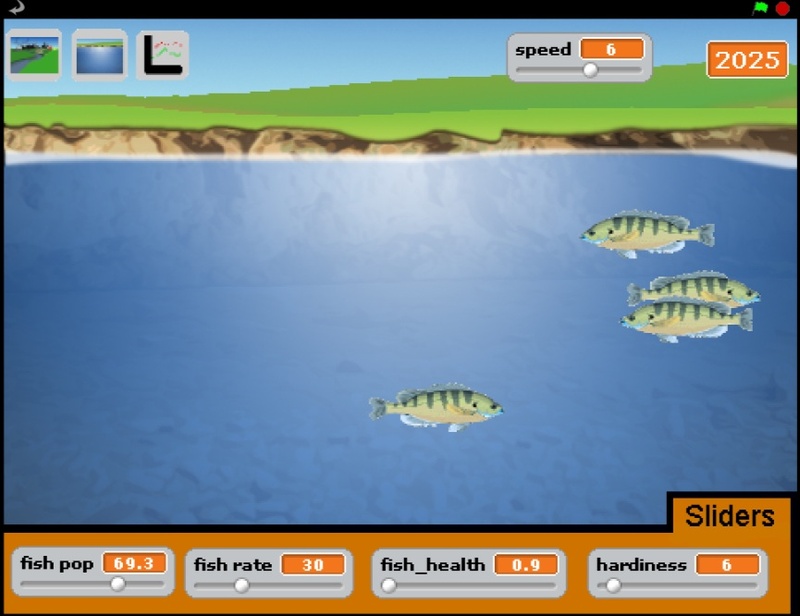 Tim is a graduate student in interaction design at the University of Maine, and he’s helped create an environmental simulator for middle school students aid their understandings of ecosystems called Sim Stream. Meet Laura, just the way Susan did at the MIT conference: http://kimpearson.net/?p=804 Laura is active with NWP@Rider - NWP@Rider is dedicated to supporting and developing literacy in the Mercer County, New Jersey area. Laura also works with literacy and Scratch and interactive journalism. Tim Baker came to MIT from Orono, Maine with his project Sim Stream. University of Maine Undergraduate researchers are developing a grades 6-8 virtual, educational system that poses environmental issues for students to explore in their own ecological system, drawing from diverse areas of study. By learning to use scientific observations, analyze data, and draw inferences in formulating decisions and policies, students develop an appreciation and understanding for natural resources, human-non-human inter-dependencies and the need for civic responsibility. About Scratch: Scratch is a programming language that makes it easy to create your own interactive stories, animations, games, music, and art – and share your creations on the web. As young people create and share Scratch projects, they learn important mathematical and computational ideas, while also learning to think creatively, reason systematically, and work collaboratively. On this episode of Teachers Teaching Teachers, Steve Muth and Ben Papell founders and on-going co-conspirators at VoiceThread join Susan Ettenheim and Chris Sloan to talk about what’s new at VoiceThread AND how they can imagine VoiceThread supporting our efforts with http://voicesonthegulf.org. Collaborative and competitive dialogue is something I talk about in Teaching the iGeneration and something that VoiceThread facilitates nicely. We could talk about how our world emphasizes competitive dialogue—-kids are surrounded by marketing messages and celebrities and politicians screaming for attention and unwilling to listen to other viewpoints——but collaborative dialogue is essential for solving the kinds of global, cross-border challenges our world is facing. Alicia Blair, a colleague and science teacher at an alternative school in Mississippi, and Gail Desler, who works with teachers in Northern California, join us as well. Alicia and Gail have been helping us to keep it real all summer.